Bryan with the Speed 400 powered DimWatt after its first flights, before upgrading to brushless power. You’ve built a Speed 400 model, whether from scratch or from a traditional or almost-ready-to-fly (ARF) kit. You’ve flown it for a while, and experienced the fun and convenience of a small model. But now, you’re yearning for more. Longer flights, better performance, or perhaps a bit of each. Where do you go from here? What can you do to your model to make it better? Do You Have the Right Plane? First, make sure you have the right plane. If you’re flying a Speed 400 parasol-winged old-timer style model, and want to make high speed passes and pylon turns, you’ve got the wrong model. Likewise if you have the latest glass pylon racer and would prefer steep climbs and long glides. Before changing anything about a model, make sure it’s the right model for the job. I won’t elaborate any further, since that’s pretty obvious. There are three main aspects of a model that affect its performance: drag, weight, and energy. Reducing weight and/or drag will improve almost any model, giving increased rate of climb, faster flying speeds, and longer flights. Drag is a force that operates in opposition to the forward motion of the airplane, and reducing it can make a big difference. Because the amount of drag force is proportional to the square of the airplane’s speed, even a small reduction in drag can make a significant difference. However, we’ll just look at drag reduction briefly before moving on to the more interesting topics of weight and energy. If speed is not one of your main performance goals, drag may not be worth worrying about, since it has less effect at lower speeds, but it still can make small improvements to climb performance or run time. Weight is the biggest enemy of flight. It is for this reason that birds have hollow bones, and a 36-foot span Cessna 172 that can carry four people weighs (empty) about half as much as the family car (also empty). Weight must be held aloft by lift, and one by-product of aerodynamic lift is drag. Lifting more weight also requires more energy. In an electric model, a large proportion of the weight is in the power system (primarily the motor and battery), and this is where the largest savings are to be had. Since the subject of this article is improving on a Speed 400 power system, we are starting with a relatively heavy motor (for its power output), and also one that is very inefficient (meaning that we’re wasting a lot of power from that heavy battery). Energy is what makes flight as we know it possible. Without energy, we will not get into the air (even a glider needs energy to get started, whether by tow plane, winch, or hand launch). More energy means more performance, assuming that the energy is used wisely. Energy is power multiplied by time; it is the ability to get a job done, whether that job is to climb to a certain altitude, or fly through the air at some speed for a length of time. A Speed 400 power system, for all its usefulness, is actually very inefficient. Only about half of the energy stored in the battery ever makes it to the propeller shaft (i.e. the efficiency is about 50%). Some of this is lost in the battery itself, and some in the speed control, but the majority is wasted inside the motor and turned into useless heat. This means that without changing the battery, we can theoretically almost double the amount of energy that makes it to the propeller. We can use this extra energy to fly higher, faster, longer, or some combination of these. Alternatively, we can choose a power system that uses a smaller battery to achieve the same climb, speed, or run-time as the original battery provided with the Speed 400 motor. The possibilities are endless. The Modelair-Tech DimWatt is a 34-inch Speed 400 sport model with performance typical of the breed. Is the climb satisfactory, or is there a fine line between climbing and stalling (like the feeling you get when you are sitting in a chair on the verge of tipping over backwards)? Are the flights sufficiently long, or do you feel as if you’ve barely reached circuit height before it’s time to land? Does the model fly at the speed you’d like, or is it barely able to fly fast enough to remain airborne? All of these questions must be answered in order to choose a power system upgrade for your Speed 400 model. There’s nothing like an example to make a point, so let’s look at one. Bryan, a colleague at work, recently decided to try his hand at electric R/C, and asked me for suggestions for a low-cost entry level aircraft that he could build from scratch. 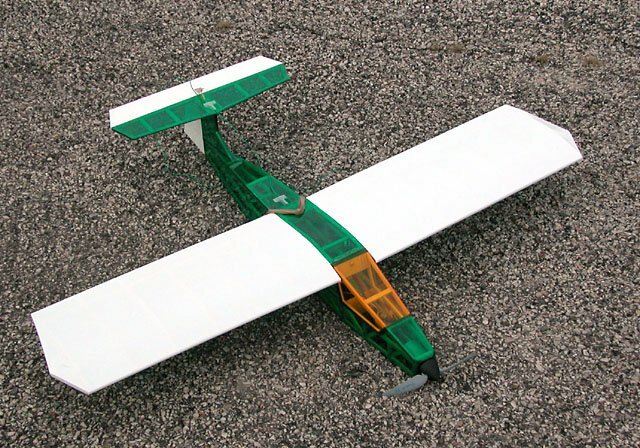 I had a set of plans for a Tom Hunt designed Modelair-Tech DimWatt that I had never gotten around to building, and suggested that this would be a reasonable first model given that an experienced electric modeler would be around to help with construction and flying. This is the power system originally used: 6×3 propeller, Speed 400 motor, home-made speed control with battery eliminator, and 7x1100AAU battery (not shown). 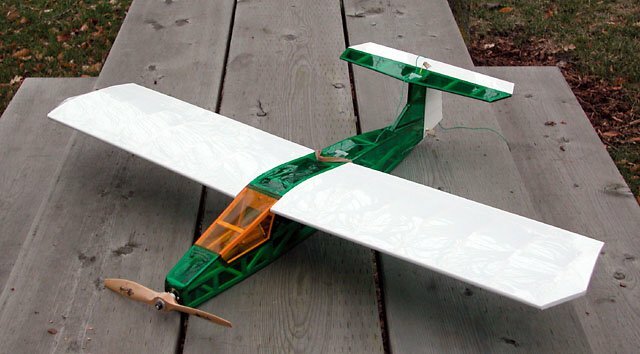 The DimWatt is a typical Speed 400 sport model, and is part of Modelair-Tech’s Stik series of designs, which are built almost entirely from 1/4 x 1/8 inch balsa sticks. It has a 34 inch wing span, 321 square inches of area, and a flying weight of 14 to 20 ounces. With a Speed 400 6V motor, Graupner 6×3 folding propeller, and a 7x1100AAU battery, Bryan’s DimWatt came to 15 ounces, and flies like one would expect of such a model: at a comfortable speed, with sufficient power for steady climbs, and about 10 minutes of flying time at partial throttle. The DimWatt is not designed for speed, so there’s little point in trying to make it fly much faster. Instead, we decided we’d try to improve the climb performance, and get longer flying times too. To that end, we chose a Razor RZ400 brushless motor with 4.4:1 planetary gearbox, Castle Creations Phoenix 25 brushless speed control, and a 9×7 propeller. This combination was chosen to deliver about the same amount of power to the propeller as the original Speed 400 motor, but get much more of the stored energy to the propeller (in the form of longer duration). A happy side-effect of this motor choice was a one ounce reduction in model weight. We also considered using a lighter battery of lower capacity, further reducing the model’s weight (and hence increasing the power-to-weight ratio). Table 1 shows the performance as predicted by MotoCalc. Take the duration figures with a grain of salt. These assume level flight from a hand launch with no turns and with the throttle at the lowest possible setting that would maintain altitude. Typical flights will last about half this long. What is significant here is the relative predicted duration, not the duration itself. The upgraded power system kept the original battery, but switched to a 9×7 propeller, Razor RZ400 motor with 4.4:1 gearbox, and Castle Creations Phoenix-25 speed control. A home-made plywood adapter plate makes the motor a drop-in replacement for the Speed 400. Although the output power to the propeller is slightly less (37 instead 42 Watts) with the Razor system (due to our choice of propeller), notice that the input power required is MUCH less (49 instead of 76 Watts). This is as a result of the increased motor efficiency. Furthermore, thrust has increased (at about the same pitch speed) due to the better efficiency of a larger propeller. Notice that even with a lighter battery of only half the capacity, duration has increased slightly due to the higher efficiency of the power system and the reduction in weight. However, we chose to stay with the 1100AAU packs simply because we already had them. One minor problem we ran into was that the new motor/gearbox/propeller combination was so much lighter than the Speed 400, that we had to move the battery forward significantly to rebalance the plane. 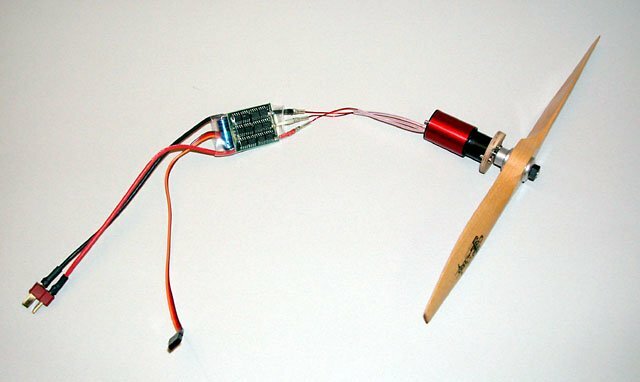 The upgrade we’ve looked at so far went from one extreme (low cost, low efficiency, brushed ferrite motor) to the other (top-of-the-line, high-efficiency, brushless motor and speed control). There are of course many possible lower cost upgrades worth considering. The 9×7 propeller looks significantly larger than the original 6×3. We used a wooden propeller to keep the weight down. The easiest upgrade to perform is to add more cells, possibly of lower capacity in order to save weight. For example, one could switch to an 8-cell pack of KAN950 nickel metal-hydride (NiMH) cells. Compare the first and second columns of Table 2. This doesn’t give quite the improvement that the brushless setup does. Climb has improved marginally, and duration has gone down, both because the motor is less efficient than it was on seven cells, and the lower cell capacity. Also, motor longevity will suffer at this current level, requiring frequent replacement of the motor. Those who have read my column for a while will know that I’m a great fan of putting gearboxes on motors. Most electric motors prefer to generate low torque at high rpm. A gearbox trades some of that rpm for torque, allowing the use of a larger, more efficient, slowly turning propeller. The rule of thumb is to choose a gear ratio, and then choose a propeller whose pitch is that of the direct drive propeller multiplied by the gear ratio, and whose diameter is that of the direct drive propeller multiplied by the square root of the gear ratio. For example, if we choose a 2.33:1 gear box (such as Hobby Lobby’s MJ8014), the propeller to use should have a pitch of 7 inches (3 inches times 2.33) and a diameter of 9.16 inches (6 inches times the square root of 2.33). The closest available size is 9×7, which is also what we used with the Razor. The third column of Table 2 predicts the performance with this system. Notice that both climb and duration have improved, with no change in input power (and a slight reduction in output power due to gearbox losses). 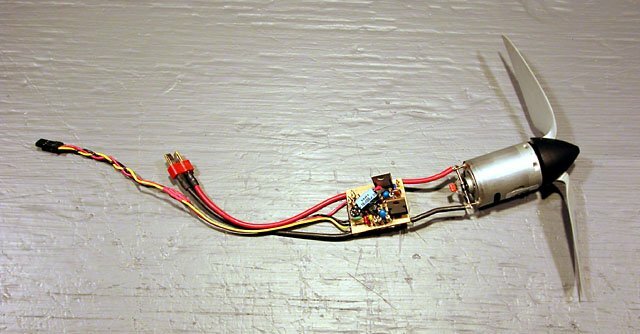 There are motors that are better than a ferrite Speed 400, yet less expensive than a brushless motor setup. An example is the Maxx Products Cobalt 400 13-turn motor. The fourth column of Table 2 predicts the performance using this motor. The performance increase is only marginal over a plain Speed 400 motor primarily because these cobalt motors are more efficient at higher currents, but that would require a battery capable of delivering those currents. Upgrades can be combined, for example by adding cells, using a better motor, and gearing it. For example, with 8 cells, the Cobalt 400 motor, a 2.33:1 gearbox, and a 9×7 propeller, one can expect the performance shown in Table 3. The performance approaches that of the brushless setup, but at the cost of duration. Everything requires a trade-off. To get more duration, you can pay for it with climb rate or money (better motor or larger battery). Likewise, stronger climbs cost either duration or money (this time for either a better motor, or frequent replacement of a low-cost motor). Can the Model Handle It? One very important thing to consider when upgrading a Speed 400 model (or any model for that matter) to a more powerful power system is whether or not the model’s structure can handle the additional strain. A more powerful motor will generally have more torque (twisting force). If full power is applied too quickly, a model designed only for a Speed 400 motor might suffer structural failure when a stronger power system suddenly starts a larger propeller. Another potential problem is in-flight failure due to aerodynamic stresses. For example, if an entry-level Speed 400 pylon racer is outfitted with a motor producing three times as much power, the plane can be expected to fly about 44% faster. This means that aerodynamic loads in level flight will be approximately doubled, as will the G-forces acting on the model in turns. This can cause the plane to exceed its design limitations. Speed 400 models are simple, fun, and perform quite well. But after a time, a modeler may want more, whether in the form of speed, climb, or duration. There’s no need to start with a new model at that point. With the right upgrades, an entry-level model can gain a new lease on life and take the modeler to the next stage. Dear Stefan, I’d like to ask if I’m going to replace my speed-400 6v motor with an inrunner brushless motor, what would be the best substitute that will perform better efficiency, lighter and can produce more rpm? I would appreciate if you can give me some ideas and specs on how to convert my speed-400 motor to inrunner brushless motor. Thank you! Armando, it’s not that easy. There is no one "best" substitute for a Speed 400 motor. It all depends on the battery you’re using, the flying characteristics of the airplane, and the propeller you want to use. You can’t select a motor in isolation; you have to select it as part of a system.